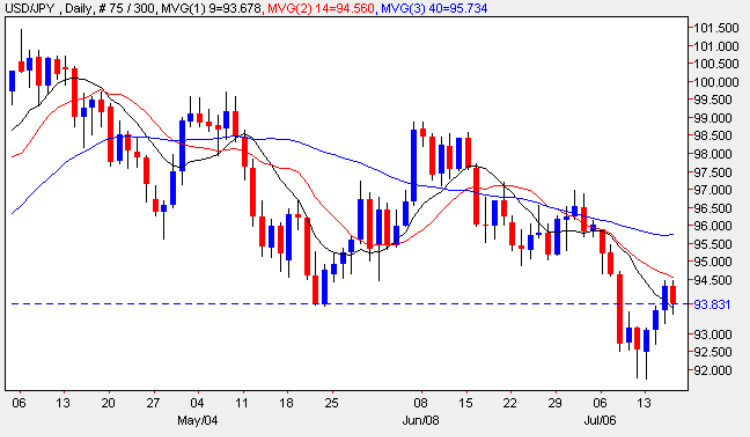 Yesterday’s up candle on the yen to dollar daily chart confirmed once again the tweezer bottom outlined in this week’s market commentaries with prices breaking and holding above the 9 day moving average. However, for longer term trend trading I would now advocate extreme caution for two reasons: firstly the dollar yen pair are now approaching the strong resistance in the 94.50 price point with yesterday’s price action failing to breach this significant level. Secondly the high of the day failed to penetrate the 14 day moving average which restricted the move higher and finally this morning’s price action has found a move higher equally difficult with the 14 day moving average once again proving stubborn. As a result and in conclusion the analysis would tend to suggest that this was simply a short term reversal higher and that in due course the bearish sentiment following the breakout from last week will resume towards the 90 level in due course.